As a senior emergency clinician at NYC Veterinary Specialists, Trisha Joyce, DVM, has seen her share of doggie trauma. But she says some of the saddest cases are the least dramatic: dogs suffering from severe arthritis. Scientific studies indicate that 20 percent of middle-aged dogs and 90 percent of older dogs have osteoarthritis in at least one joint. it’s hard to stop the disease once it has set in, according to James Cook, DVM, at the University of Missouri-Columbia. Dr. Cook and his research team, however, may have found the key to early diagnosis. It’s what he calls “the Holy Grail” in the fluid that surrounds and lubricates the joints of both dogs and people. Dr. Cook sampled this fluid from dogs known to have osteoarthritis and from others without the disease. As he wrote in the American Journal of Veterinary Research, when he analyzed the proteins in the fluid, a pattern became evident. The scientists noticed that quality and quantity of this fluid were altered in arthritic dogs. Examining the fluid even more closely, they identified seven proteins that appear to be linked to arthritis. The proteins increase and decrease in patterns that “are consistently different than [patterns] found in normal patients with no arthritis at all,” notes Dr. Cook. Dr. Cook and his team plan to follow healthy dogs over time to see if the pattern can correctly predict which dogs end up getting arthritis. If everything happens as theorized and according to schedule, he hopes that a screening test will be available for young dogs in three to four years. Warning signs Watch for decreased activity and signs of pain. These may be overt (e.g., limping, lameness, whimpering) or subtle, like a typically pleasant dog becoming snippy. Some arthritic dogs may consistently stop doing only specific activities, such as jumping on the bed or into a car. Diagnosis If you think your dog has arthritis, schedule a visit with your veterinarian for a comprehensive diagnosis of the problem. Knowing which joints are affected, and how severely, can greatly help determine which treatment options to consider. Treatment Dr. Joyce says that while arthritis is forever and can’t be undone, certain medications can alleviate pain and symptoms. Other considerations include alternative treatments like acupuncture and hydrotherapy. 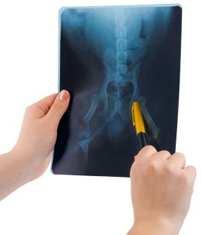 Surgical procedures are an option for extreme cases. Most dogs will achieve a higher quality of life with any of these treatments. Activity The best way to treat and prevent arthritis is to help your dog stay in good shape. Maintain its weight in the low end of the normal range and keep your pet active just enough to sustain muscle tone and strength. Start with moderate levels of activity — a brisk walk, limited periods of playing in the park — and work your way up. Through trial and error with careful monitoring, you can find your dog’s “sweet spot” of exercise for optimal joint health. Diet A healthy diet is a big part of staying in shape. Dr. Cook recommends going with name brands that commit to putting science into dog food, offer well-balanced nutrition and are tailored to specific breed sizes. He says that while supplements cannot prevent the disease, they can help alleviate pain. “Pet foods with glucosamine and chondroitin or fish oil can help manage the disease because they reduce inflammation and degradation,” he adds. Is the ultimate solution — a cure for arthritis — within reach? Dr. Cook says he hopes his research is starting to point in the direction of a cure. If his pattern of biomarkers can truly predict arthritis, scientists will be closer to determining the root causes of the disease.